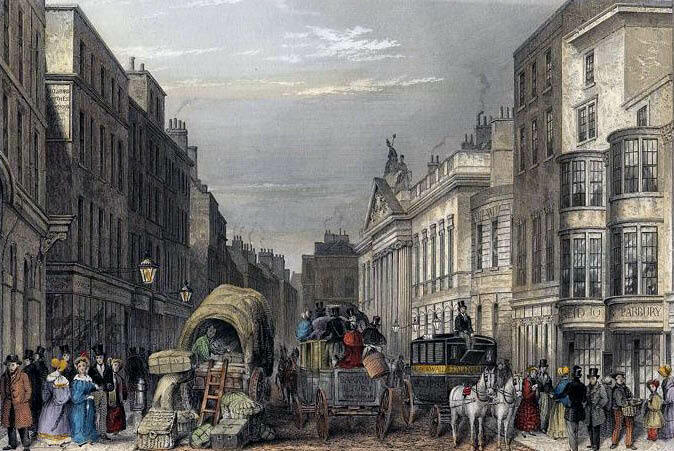 Leadenhall Street in London, painted by J Hopkins c1837. Travel journals offer us a window into the past. They free us from the interpretations and opinions of modern historians and offer us eye-witness accounts, from the perspective of a visitor to a foreign land. The big events in history often had an impact on what tourists found when they arrived at their destination, but they were seldom the focus of their writing. Instead, they have left us with a snapshot of everyday life: the rich and the poor, the towns and the countryside, the behaviour and the misbehaviour. It is probably the closest we will ever come to travelling back into the past to find out what life was like. These old journals do not deserve to be forgotten; they are the key to our own history. This will be the initial focus of my blog – an exploration of largely forgotten travel journals. I will be looking mainly at 19th Century journals. It was a century that saw an explosion in the diversity of journals, with travel became faster and easier as the century progressed. But the blog will not be limited to the 19th Century or even to journals. I want to look at publications from the past in general, investigating far beyond the well-known classics, finding interesting gems from long-forgotten books. There are many many thousands of books that have long since gone out of print, and are rarely read today, including some writers who were as popular as modern best-selling authors in their day. Non-fiction will be the richest seam to mine, but there may be some occasional forays into the world of fiction, and I will also be attempting to unearth some unpublished manuscripts for their historical insights. Instead of ploughing right in with my first look at a 19th Century journal, I felt it was important to explain first the premise of the blog and what lies ahead. The posts will be a mixture of simple quotes from interesting texts with some degree of commentary, and essays interspersed with relevant quotes. If you would like to know when a new entry is posted, please click the “Follow Windows into History” button on the right side of the screen. You do not have to be a member of WordPress. You will be prompted to enter your email address and then the system will automatically email you every time a new article is online. I hope you enjoy sharing this journey through the windows into history that forgotten texts offer us. Good morning, thanks for stopping by and following my blog. The premise of your blog sounds interesting. I am sure I will enjoy going back in time to visit early travel journals. Looking forward to following you as well. Wonderful idea! Thanks for following me. I will be checking in on your journal entries. Looking forward to the unearthing of forgetten gems. One of my constant thoughts are, as libraries purge their dusty collections, we’ll lose these windows to the past. It’s always in these old items largely forgotten that I find great insights to reality as others saw it not so long ago. Some of the universities are doing fantastic jobs at scanning old books, but still it is inevitable that a lot will have been lost over the years. Unfortunately some of the most useful books from a social history perspective are probably the ones that would have been considered disposable over the years. Much to my disappointment, the British universities seem to be lagging behind the American and Canadian ones in scanning books and offering the scans online, so it is relatively easy to find interesting texts referring to North America, but much more challenging to find British texts, without tracking down physical copies. Thanks for sharing that good news. Look forward to future posts that bring this context to light. Thanks for your comment. Your photography is absolutely stunning! I would recommend anyone to take a look at Eddie’s blog, particularly if you like atmospheric b&w photography of landscapes and buildings. This is a fantastic project. Great writing that has fallen through the cracks of history. Looking forward to reading more of this. Much appreciated. I hope you will enjoy looking at my pictures as much as I enjoy making them. Yeah – interesting and different! Nice idea with these journals. Unfortunately I can’t read long texts on the computer, but I am sure that some of your writings will inspire me to find a hard copy of the books you are reviewing. Thanks for your comment! Some of them are quite rare and difficult to find copies of at a reasonable price, but it obviously varies from book to book. Fantastic idea for a blog, thanks for the follow. I’m looking forward to reading more! What a lovely idea! One of my all time favorite books is a travel journal — Goethe’s Italian Journey. I saw Italy through his eyes before I saw it through my own and I’ve been grateful ever after for such a guide. I am quite convinced that following in the footsteps of some of these old travel journal writers, and comparing how things have changed or stayed the same over the years, would make for a fascinating holiday. I may have to thing about something along those lines myself one day! I “followed” Goethe over the Brenner Pass and then stayed in Verona because Goethe had written in detail about the city. I had a couple of other agendas of my own, but that was one of them. It was really thrilling to see the Arena because I’d already “seen” it through Goethe’s eyes. It was also cool to see how many things in that area had been named for Goethe — it made me think of all the people who might have followed him just as I had. When I was a kid I was passionate about Lowell Thomas’ journeys, too. I’ve also read (since I lived in China in the 80s) a lot of old diaries of the “Old China Hands” — they are, as you say, windows on a time. Anyway, I’m looking forward to reading more of your blog. I have been enjoying your interesting and inspiring exploration of former travel writings. I sometimes see myself as an adventurous traveler, but pale beside those early travel explorers. Thanks for your comments! I am pleased you have been enjoying the blog. There will be more journals and snippets in November, after the Creepy History series concludes. Looking forward to time-journeying with you through your blog, Thank you for the follow, and love the idea of the “Creepy History” series. Thanks for the follow. I’m enjoying reading your posts. This is such an interesting focus for a website. Looking forward to following. Thanks for the follow! Your blog is fascinating. Looking forward to reading more of it. Interesting blog you have. Thank you for following my blog! I just have to ditto everyone else – great idea for a blog, and thanks for the follow! Very cool concept! I’m a bit of fan of history myself, looking forward to exploring your blog. Cheers! Thanks for following my blog. Yours is providing a valuable service to those of us who have found old books that we liked enough to borrow a second time gone, replaced because of new pressures that are put on instructions to be all things to all people, a quixotic mission. Thank you for the follow. Your blog looks fascinating. Glad you found us so we could find you! Brilliant idea for a blog. I have read some old journals myself, and will try to follow you as well.. Thanks for your comment, and I am open to any suggestions about interesting old journals to read! I have just recently been looking at “On the Road in England” by HM Bateman. It is a bit too recent for me to cover for the blog (1940), but I can certainly recommend it. I’ll be back on this! I’ve been having a lovely time reading some of your snippets! So interesting to read travel journals from history. Thanks for your comment 🙂 Always nice to get positive feedback and congratulations on an excellent blog yourself! Thank you for the follow! Much appreciated. Thanks for the recommendation. Her writing is a bit recent for the blog as I try to look at 19th Century and before, but I will take a look for my own interest. Thank you for posting such an interesting blog. I look forward to following you. What a delightful find! History one can enjoy. I’ll be back! Thanks for your perusal of my posts at Stepsandpauses – some of which may in a hundred years prove indicative of how life was in 2015. Thanks for your comment, and welcome to the blog! Great blog! I’m glad I discovered you, looking forward to browsing. And thanks for following mine! What a wonderful idea!! Really enjoyed reading some of the posts!